Polarized lenses are available for most Wiley-X eyewear, with the exception of the CQC Goggle. They are available as a special order. Replacement or additional lens sets are also available upon special order. Please call for more information. (Above right) Our friend Sgt. 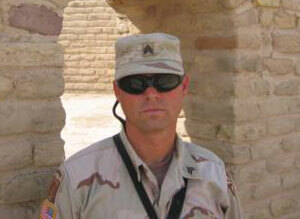 Wyatt at the House of Abram in Iraq, protecting his eyes and looking stylish with Wiley-X SG-1 protective sunglasses.